The Pencil Tester is an effective method to test coatings for their hardness and resistance to scratches and wear. The test method allows the use of pencils which have a known hardness grade to be moved over the surface to be tested at a fixed angle and pressure. These pencils, when passed for a specified number of times on the coating will also allow a wear factor to be determined which is related to the hardness of the pencil used. 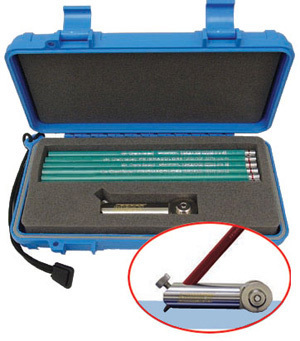 Using this Pencil Tester, it is possible to evaluate coatings on a vertical plane. The pressure or weight applied relates to pencil lead crushing and therefore can be used for vertical coating evaluation to achieve repeatable results. For this test, pencils of increasing hardness values are moved over the surface in a precisely defined way until one lead damages the surface. Surface Hardness is defined by the hardest pencil grade which just fails to damage the surface. Observe the pencil track. Sufficient pressure must have been applied either to cut or damage the coating or to crush the lead pencil point. If neither coating damage or pencil point crushing is observed, repeat the test until a definite observation is made. If scratching or damage of the surface occurs, proceed with the next softer pencil grade and repeat the testing process until a pencil lead grade is found which crushes and does not damage the coating. If crushing of the hardest lead should occur, the coating is therefore extremely hard and is beyond the measuring range of this test.